Representative Honours: Northern Ireland: 5 Full Caps (1999-2001), 2 B Caps (1997-1999); Irish League: 4 Caps/2 Goals (1991-2000). Club Honours: (with Glenavon) Irish Cup Winner 1996/97, Runner-Up 1990/91, 1995/96; Gold Cup Winner 1990/91, 1997/98; Co. Antrim Shield Winner 1990/91, 1995/96; Irish League Floodlit Cup Winner 1996/97; Charity Shield Winner 1992 (shared); Mid-Ulster Cup Winner 1990/91; (with Linfield) Irish League Champion 1999/00, 2000/01, 2003/04, 2005/06, 2006/07, 2007/08; Irish Cup Winner 2001/02, 2005/06, 2006/07, 2007/08, Runner-Up 2000/01; Co. Antrim Shield Winner 1997/98, 2000/01, 2003/04, 2004/05, 2005/06; Irish League Cup Winner 1998/99, 1999/00, 2005/06, 2007/08; Charity Shield Winner 2000; Setanta All-Ireland Cup Winner 2005; (with Distillery) Irish League Cup Winner 2010/11. Awards: NI FWA Player of the Year 2000/01, 2003/04, 2005/06; Ulster Football of the Year 2000/01, 2003/04, 2005/06; NI PFA Player of the Year 1993/94; Umbro NI Player of the Year 2006, 2007, 2008; Umbro NI Top Goalscoer 2008; NIFWA Hall of Fame Member 2011. Key: IL - Irish League/Irish Premier League/IFA Premiership; EUR(Europe) - UEFA Champion's League, UEFA Cup, Cup Winners' Cup; Ot(Other) - Irish Cup, Legaue Cup, Floodlit Cup, Gold Cup, Ulster Cup, Co. Antrim Shield, Mid Ulster Cup, Charity Shield, Setanta Sports Cup. Glenn "Spike" Ferguson's prolific Linfield career was brought to a close in May 2009 just two months shy of his fortieth birthday. His place in the pantheon of Irish League goalscorers has long been assured as he has claimed 534 goals in a 22 year career with the Blues, Glenavon and Ards - only Jimmy Jones and Joe Bambrick have scored more goals in the local game. A record three time Ulster Footballer of the Year, Ferguson has claimed six League titles, five Irish Cups and 18 other winner's medals in his illustrious career. He surpassed the 500 goal mark with a brace in February 2008 with a brace against Crusaders in the CIS Cup Final and that same month became the all-time topscorer in the Irish Cup. It was for Ards on the 5th March 1988 that Ferguson scored his first Irish League goal in a 1-0 win at Glenavon. It was a move to the Lurgan Blues in 1990 that would allow Ferguson to really shine as he developed a highly effective partnership with Stephen McBride. The duo fired the Mourneview-men to a position where the Belfast "Big Two" were regularly unseated in the trophy stakes. In 1996 Ferguson seemed destined for a move to Austrian side, Salzburg before eventually making an Irish League-record £55,000 move to Linfield mid-way through the 1997/98 season. 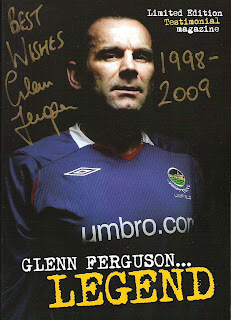 Regularly highlighted as a player that "could have made it across the water", Ferguson's record with Linfield brought him the title of "the Irish Romário" from one publication. His muscular physique brought him the nickname of "Sumo" from some quarters but he used his size to great effect as well as his excellent touch, positional sense and powerful shooting and heading. Five goals in European competition is also a Linfield record and he was regularly hailed by fans of all clubs as the "best player in the Irish League" even in the veteran stages of his career. First capped by Lawrie McMenemy in a friendly match against Canada in April 1999, Ferguson was given a run in the team under Sammy McIlroy. His international career was brought to a close following an incident in a Prague nightclub, after a World Cup Qualifier against the Czech Republic, led to his arrest and McIlroy announced that Ferguson would no longer be considered for selection. Following his surprise release by Linfield, Ferguson made clear his intentions to play on for at least one more year. On 30th May 2009 he was unveiled as a Lisburn Distillery player. He extended his career for one last season and played his 1,000th club game when he came on as a substitute to set up the winner against Newry City on 28th August 2010. On 22nd February 2011 he scored his 562nd club goal, as Distillery lost 4-2 to Ballinmallard United in the Irish Cup, surpassing Joe Bambrick and putting him behind only Jimmy Jones in terms of goals scored in the local game. In April 2011, at the age of 41, he was Man of the Match as Distillery defeated Portadown in the Co-Operative Insurance Cup final. On hanging up his boots at the end of the 2010/11 season Ferguson was inducted into the Northern Ireland Football Writers' Association Hall of Fame along with the only man to outscore him in the local game, Jimmy Jones. He joined the coaching staff at Distillery, taking joint temporary charge following Tommy Wright's departure in November 2011 before becoming assistant-manager. On 31st December he was confirmed as manager of Ballymena United. Within a year he had led the Sky Blues to their first trophy in 25 years as they defeated Linfield in the Co Antrim Shield final. Continued good form in the knock-out competitions saw the Sky Blues reach the 2014 Irish Cup and 2015 League Cup finals before another Co Antrim Shield success over Linfield in January 2016. Good cup form did not however transfer to the league, and Ferguson was sacked after a run of five straight defeats just over a month after the Shield success. Summary: 1(4)/0. Won 0, Drew 1, Lost 4.